Edition of 737 of which 125 copies are signed 1-125, 27 copies are signed A-Zz as artist's proofs, two are signed as dedication copies. No progressives. This is the first poster to be printed on the 18" x 25-1/2 " Heidelberg KORD 64. Dedication copies: Clare Bell-Fuller, Sam Fuller, Claire Nicole Stremple. Janus, the god of beginnings and transitions, is depicted as having two faces, since he looks into both the past and the future. In June of 2014, my press of almost fifty years finally gave up the ghost. A search for a replacement yielded a Heidelberg KORD 64, serial number 328023 manufactured in 1968 which was moved into Saint Hieronymus Press on September 9, 2014 immediately after the ATF Chief 24 was moved out. The KORD is larger than the Chief, having a printing area of 25-1/2" as opposed to 24", and it weighs 3 tons, one ton more than the old machine. Learning a new press is very like entering into a new love affair: it is the same only different, and the biggest mistake is to treat the new love like the old. The KORD had a troubled past, and tracing the missing parts, strange abuses and odd problems, together with a much-needed cleaning and adjusting, as well as simply to learn my way around, took a few more months during which time I ran small jobs, each one more complex than the last. 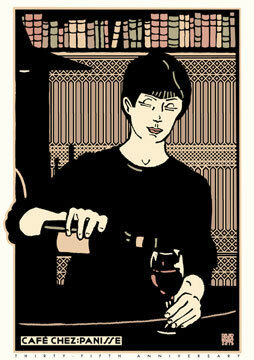 Finally mustering my courage, I started printing a poster for the Chez Panisse Café 35th anniversary. My colleague Richard Seibert has a 1965 Heidelberg cylinder KSBA which came with a small magnetic name tag: "Othello." It struck our fancy to make a similar name tag for the newer press, "Desdemona." So, Othello and Desdemona sit side-by-side, printing harmoniously, yet by different processes, the old and the new, letterpress and lithography. Our annual Chinese New Year card was printed by both processes on both presses, looking Janus-like into the past and into the future. .